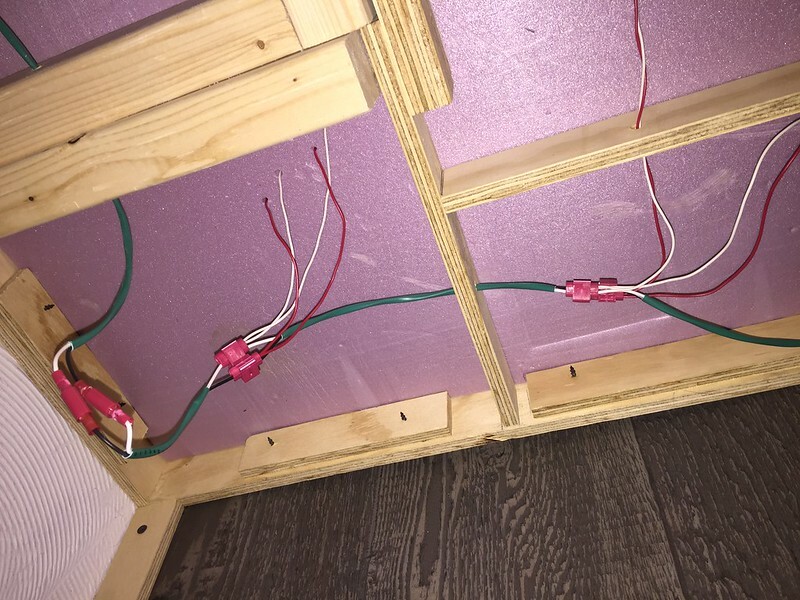 - When you run the buss wiring (two wires), select a dufferent color for the right and left rails and use this color coding through the entire layout. I like using red wire for "right" rails and black wire for left rails. Follow the same coding for the feeders. - The buss wiring should be located directly under the mainline. Use the proper sized buss wiring. I like 14 gauge, stranded wiring. - You an hang the buss wiring from eye hoops for easy and neat installation. - Use the same color coding for the feeders (22 gauge) when attaching the feeders to the buss wiring. Keep the feeder wires as short as possible within 12 - 18 inches in length or shorter if possible. 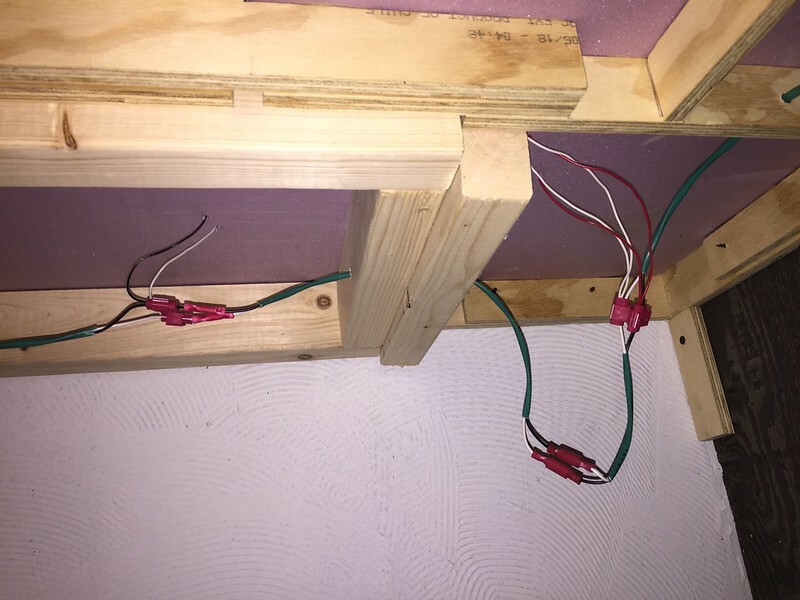 - Use "Suit Case Connectors" or IDC's to attach the feeders to the buss wiring. These make the attachment of the feeder wire to the buss wiring easy without any soldering. The conectors are color coded for the size wire that will fit into the ends of the connector. Practice closing the connectors on spare wire before working under the layout to gain experience working with thee devices. But they are easy to master. - Wire feeders beyond the diverting route of any turnout to provide power to that section of track. - The staging yard can one buss that runs directly under the center of the staging yard. Test the wiring after every several connections to make it easy to identify and correct wiring problems. I say the best way to wire it depends on the layout. If it is a large layout I would run the bus right along the main line. A small rectangular layout I would run the bus in a cross shape with only 4 feeders. Layouts in between would have different bus configurations. But regardless I'm in the twisted pair camp. I am in the solder camp (see how neat in the photo below). For large layouts I am in the stranded wire camp . If there are multiple power districts that can be close or overlapping (over under/crossing/etc) then I use different colors for the pairs for each district. Also there are multiple power districts be certain to label which is which (regardless of different color or not). The photos below are of the Greeley museum layout. 2nd photo is obviously power district #23. One doesn't have to trace the bus back to its origin to figure that out. Iron Horseman: Neat wiring and soldering. My layout is a small to medium sized folded dog-bone with a raise section over the mainline. In the folded "bone" sections of the layout the DCC buss follows the mainline where in the straight sections of the layout the bus runs down the middle of the layout. I didn't worry about twisting the buss wires to prevent interference and never had any problems. 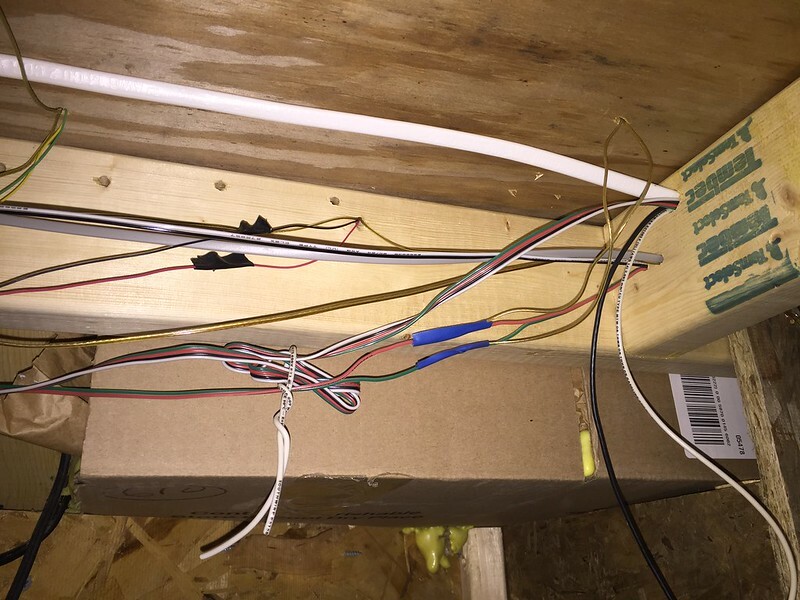 - When you run the buss wiring (two wires), select a different color for the right and left rails and use this color coding through the entire layout. I like using red wire for "right" rails and black wire for left rails. Follow the same coding for the feeders. And make sure you follow that advice! I just build a drop in section for my layout and had it all wired up and looking great. I turned on the power, dialed up a loco and as soon as it hit the new spot, the system shorted out. Took a closer look and realized I had soldered all the tracks on the section (all four of them) backwards. My wiring and construction processes have gotten better the more I have built. The first pic is still in operation, but is scheduled for a rehab. Suitcase connectors work fine IF you follow the wire size guidelines of the connectors you buy. For example, lets say you use 12 gauge wire for your power bus, and 24 gauge wires for your feeder wires. There is no suitcase connector which will allow you to directly connect a 24 gauge wire to a 12 gauge wire! Where people run into trouble, and then blame the connector, is when they are trying to use 2 sizes of wire which are not compatible with the connector. There are wire sizes listed on the connector package which are compatible with that connector and the wires must fall within that range for the connector to work properly. Now if you are using 16 gauge bus wires and 18 gauge feeder wires, no problem. There is a connector to match those wire gauges. I crimp the wire jumper down firmly, close the top until it clicks, then put a wrap or two of electrical tape around the connector as added insurance. It's a good idea to stagger the connections, as well. The way I do my wiring is to run a jumper of the same gauge as the bus to a terminal block. I use the black plastic blocks. Each block has an even number of positions. In the pic shown, this is a 6 position terminal block. Across the top set of screws I will wind a piece of bare copper wire, creating my own jumper wire. I cut this wire in the middle of the block, creating 3 positions for my red wires and 3 for the white wires. The bus jumper and feeder wires are attached to the terminal block with crimp-on spade connectors. I use 18 gauge bell wire for my feeders. Using this system, I can get the bus jumper and 5 feeders on each side of the terminal block. These blocks also come in 4 and 8 position varieties, handy depending on the wiring situation. I find this a neat and tidy way of doing the wiring. My old body does not like the thought of getting under the table to have to solder wires down there. Suitcase connectors work fine IF you follow the wire size guidelines of the connectors you buy. Since it came up, another issue with the suitcase connectors is their static quality. That is, if they are installed and left alone so they just sit there statically they are ok. If they get a lot of motion they can become problematic. During a "re-wire" project we installed them at the club under the large main yard which was also right over where all the boosters were. This was anything but static. We kept needing to run more wires, reroute wires, add new feeds. The suit cases were constantly constraining us as we tried to pull the wires through the hangers and past each other. As time passed we noticed they were getting loose, and when we investigated we discovered they had been cutting through the stranded wire. Some of the "through" bus wires (not the feeders) were almost cut in half. We went through and replace them all with normal solder joints. This is what I meant about the size/shape of the layout determines the "best" way to wire it. This is how I did the small 12x12 layout in my office. Terminal strip in the center of it all. Power goes from command station to the terminal and feeders from terminal to each of the 4 sides. I even used 20 gauge twisted pair red and white wire!